I'll show you the end before I start at the beginning. The end is that I finished and hung that awesome medal around my neck. Now the beginning. 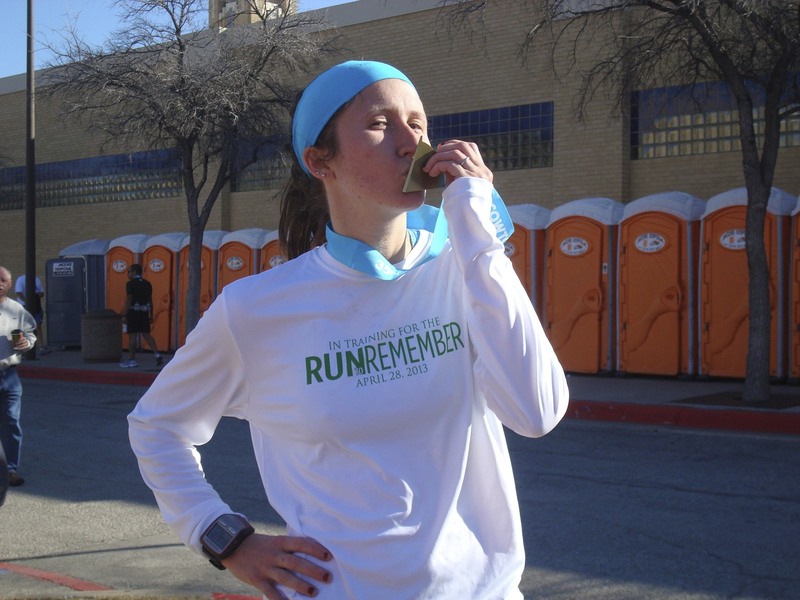 Because I want to remember everything about this race. Our alarm went off at dark o'clock, aka 5 a.m. I knew I should eat a good breakfast, but I got so nervous that all I could do was force down a few spoonfuls of oatmeal (thanks for making me some, Dad!) before I went to the bathroom 2 times. Okay 4. But who's counting? 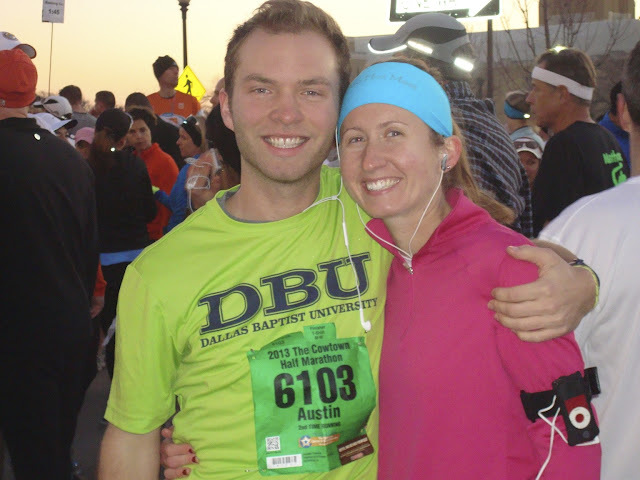 The race was set to begin at 7am, so the 6 of us piled in the car and headed into Fort Worth at 5:45. It was my dad, mom, brother, Jordan, and my brother's girlfriend, and out of all those people, it was I who made the unfortunate decision to sit in the backseat. Thus commenced the worst car ride known to the history of my life, where I spent the next 45 minutes debating whether or not to ask my dad to pull over so I could dispose of the 3 spoonfuls of oatmeal. I somehow held it together during five semi-dangerous U-turns, and after a close parallel parking job in front of a fire hydrant on a random side street a few blocks from the starting line, I nearly kicked Jordan in the face as I leapt out of my parents' Durango and fell to the ground, dew quickly soaking my shirt as I kissed the grass in some random stranger's front yard. 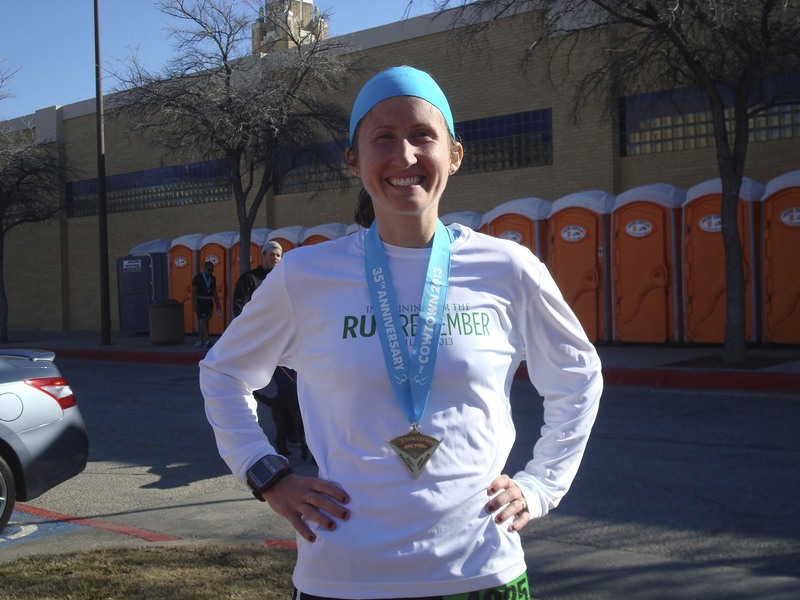 After I decided it was safe to stand up, we walked to the start, and from there it was pretty much your run-of-the-mill race-day routine, which mainly involved trying to pin my bib on straight and then standing in line at the Port-o-Potty for 25 minutes. 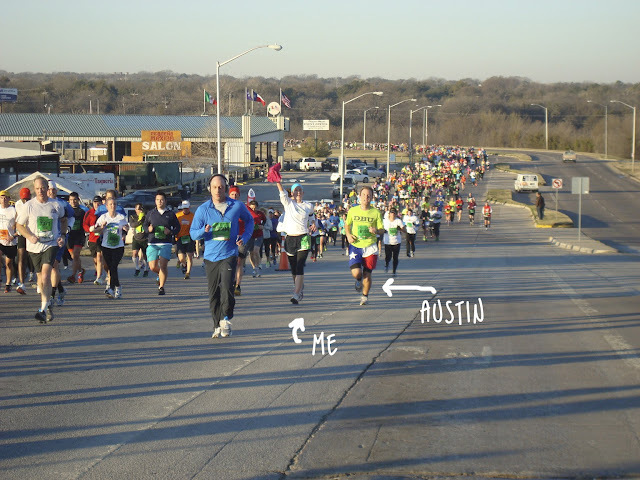 I ran with my brother, Austin, who is one of those annoying boys who is ridiculously good at everything. 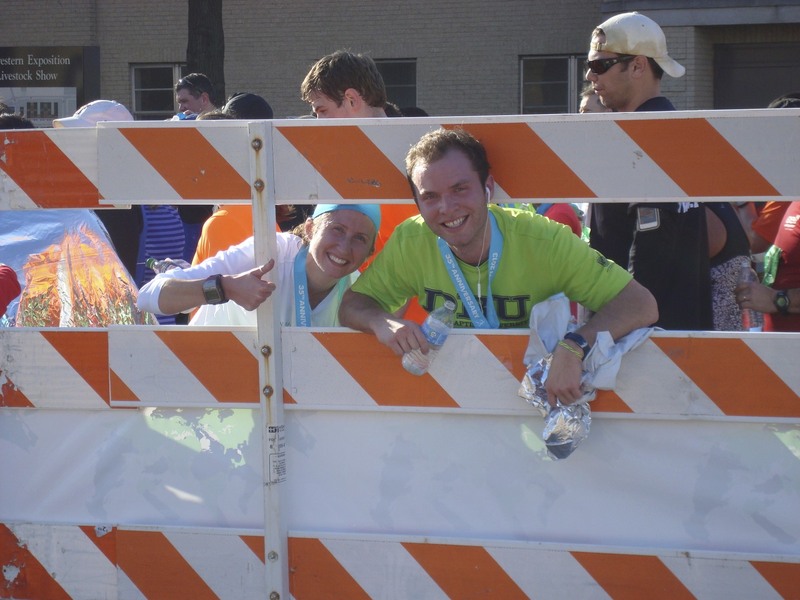 He said he ran a total of 1 mile in "training" for this half marathon. I wanted to punch him when he told me that. 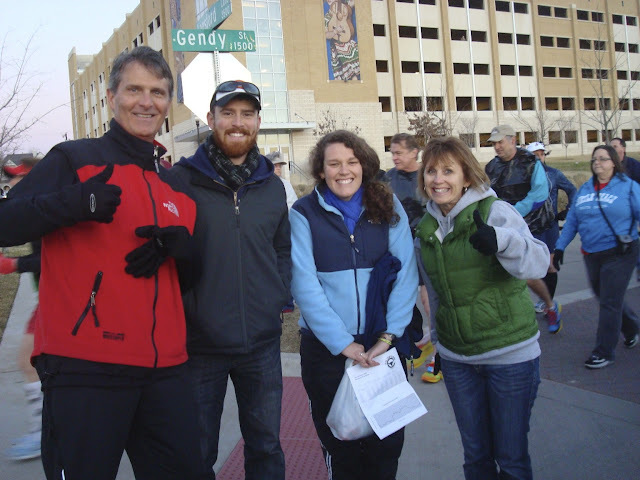 I knew we had to average a 9:09 pace to hit the sub 2-hour goal, but I did not want to go out too fast, because that was disastrous at the Oklahoma City Half Marathon last year. That was when I threatened to quit running forever. You can see how well that worked out for me. 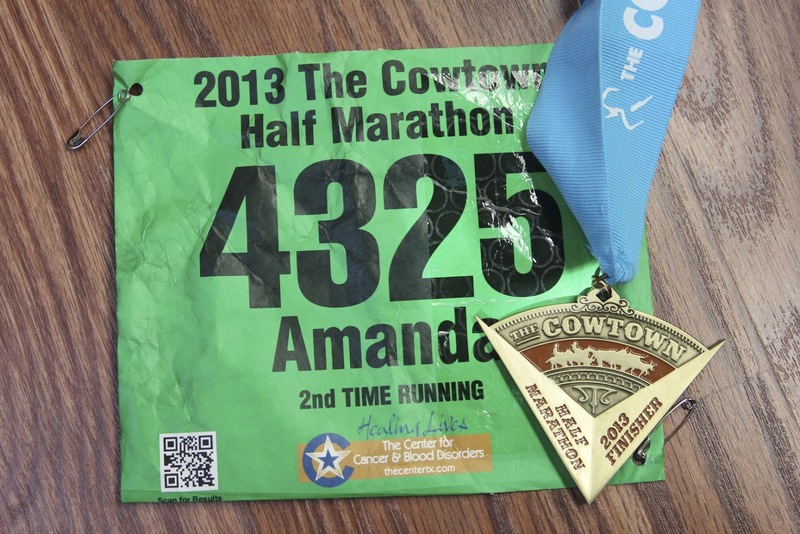 The Cowtown is grouped into corrals, so your estimated ending time determines your corral. The corral starts are staggered with 5 minutes between each, which was amazing because it meant I had to do almost NO WEAVING. If you've never run a race before you probably don't know how awesome this is, so just take my word for it. 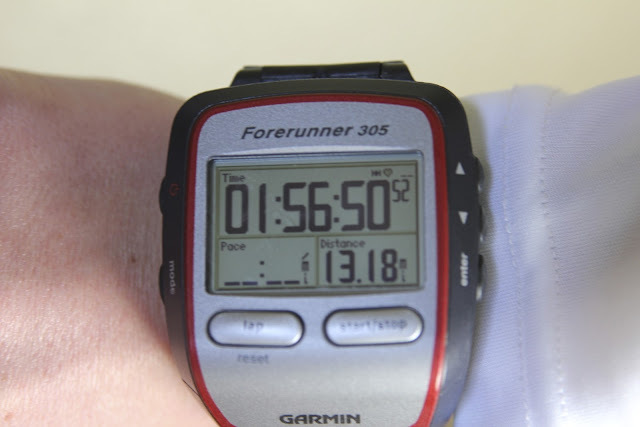 My Garmin told me I ran 13.18 miles, so that's less than one-tenth of a mile extra. Again, that is amazing. Austin and I were in corral 2. Austin and I first saw our amazing cheer section at mile 4, and at that point I was feeling really good about our time even though it was slower than my goal pace. I knew I had more than enough time to make it up on the back half of the race. When I saw my family, I stripped off my pink sweater and tossed it to them, because it was already starting to warm up. The weather was as perfect as you could ask for. 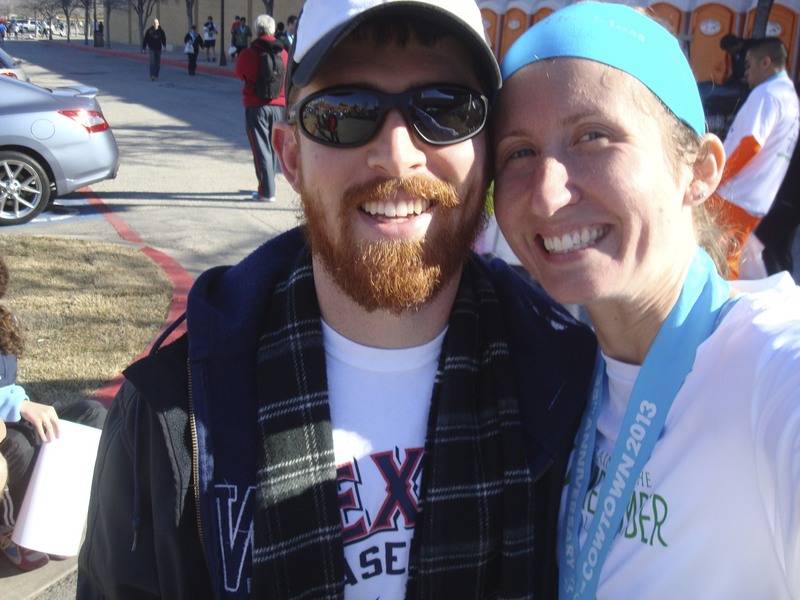 By our 10k split, we were still going strong, and we'd dropped our estimated finish time by 2 minutes. I was feeling good so far, but the kicker was going to be the terrible half-mile hill between miles 8 and 9. This thing was killer. Once we finished the hill and I was still feeling energized, I knew the 2-hour goal was mine for the taking. By the 11-mile split, I had dropped my estimated finish time by another 2 minutes. At some point I also blew past the 2-hour pace group, which I have to say felt pretty good. 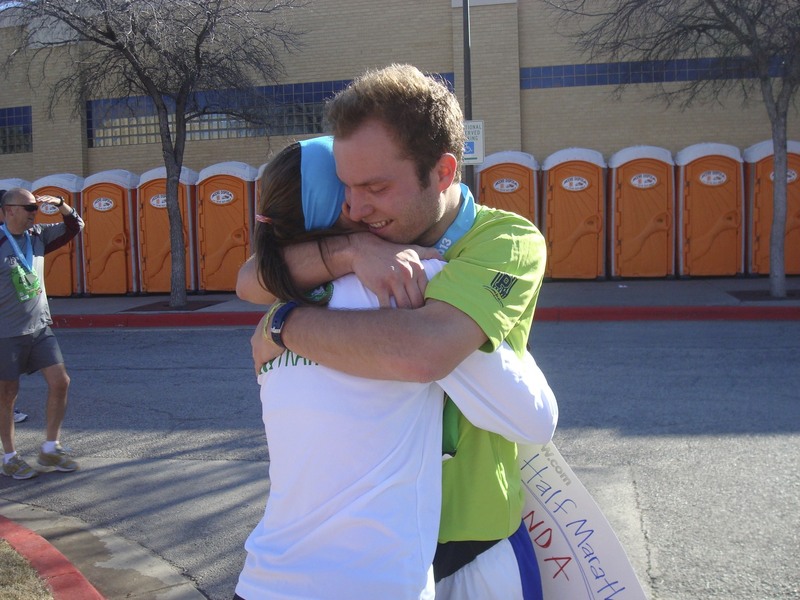 When I saw the finish line, I sprinted as fast as I could, and when I crossed, I instantly burst into tears. One might even call it hysterical sobbing, so much so that a volunteer asked me if I was okay. "I'm just so happy," I sobbed. Good grief, right? Who's got two thumbs and is a hot mess? This girl. I don't know if I've ever been so proud. 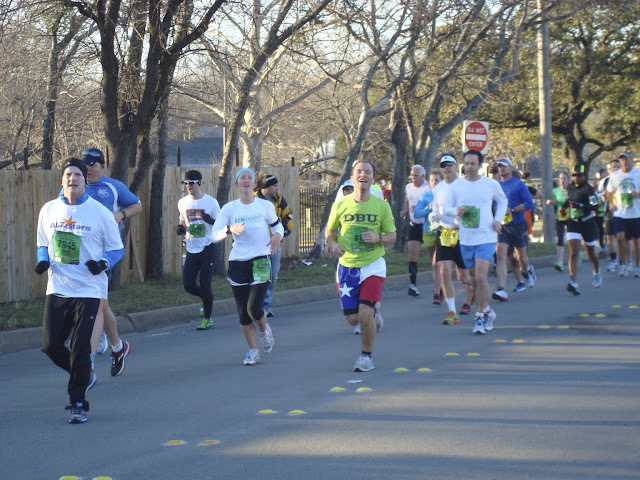 I've got a 25k training race this Saturday and then it's nothing but training runs until the marathon on April 28. I'll continue with weekly recaps until then! I couldn't end this post until I gave a special shout-out to our amazing cheer section! 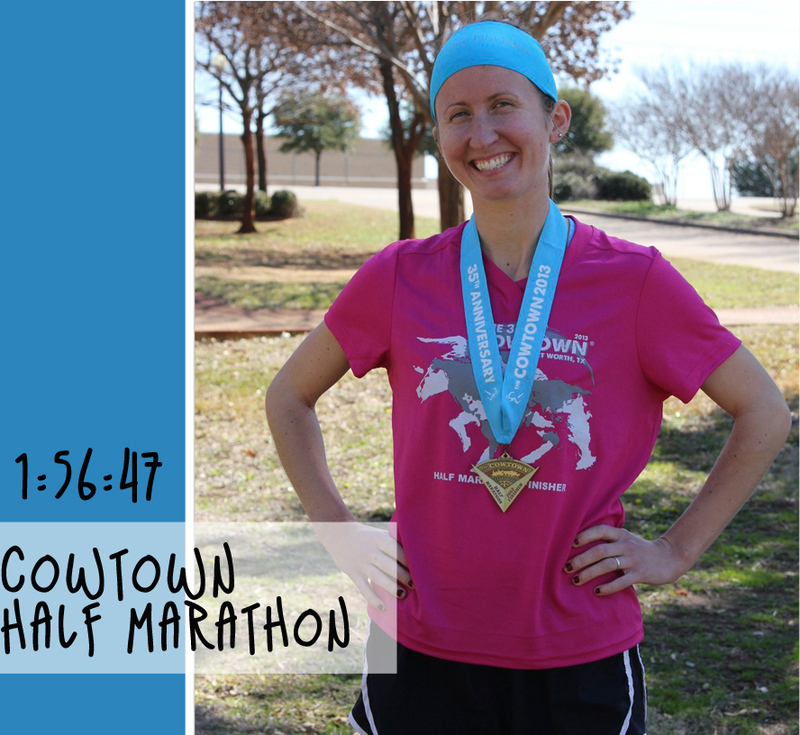 I highly recommend the Cowtown if you're looking for a fun Texas race! It's where dreams come true. Or, something like that. Bahaha, when I looked at that pic I thought the very same thing about my hand. I think I was in the middle of taking my glove off. It was a lot of fun chasing you around and a very exciting moment seeing you finish. Great job and congratulations on blowing your finish time goal out of the water! You are such a liar. This is not nearly as long as you made it sound. Anyway, congrats. That medal looks like it could double as a weapon. Maybe you should have Jordan carry that around instead of a gun. That half-mile incline looks killer, good grief. As for your dad... It looks like maybe he's got two gloves on? Or did have two gloves on? Is holding one but still wearing the other one? That's what it looks like to me, anyway. Great cheer squad. Nobody has ever found me at THAT many points along the way. You're totally on your way to rocking the full. Great job! Yeah... I did the same exact thing when I crossed the finish line of my first half. Oye, how embarrassing. And when I finally got the composure to look up from Neil's shoulder there was a photographer about 6 inches from my face just eating it up. I keep waiting to appear on some motivational poster when I least expect it. Or God forbid, on a pinterest meme!!! Congratulations! How exciting to beat your goal time! That last pic was funny. Your dad couldn't have planned the glove move better. WOOHOO on not only making your goal but DESTROYING the time! You go, girl! I think I am going to have run another 13.1 now;) Just need to figure out which one..
congratulations amanda! you did SOOO good! Under 2 hours - way to go!! and you look amazing too! YAY!!!!!! Congrats on finishing in less than 2 hours!! !